The post-Valentine's Day weather seemed to embody all the bitter singletons - it was miserable! I decided to scout around a little to prepare for tomorrow's Valentine's Couples Birdathon despite the foul weather. For the most part, the birding was slow and not worth waxing poetic or whatever you want to call what I normally do. Instead, I will just focus on the fantastic views the ducks offered up at Patricia Bay today. When it's pouring, sometimes the last thing you feel like doing is getting out of the car. Well, maybe I'm just lazy and didn't bring a rain jacket. Either way, I drove to the north end of Patricia Bay to scan through the ducks today and found the whole exercise to be rather enjoyable. I will probably have to return when the light is better and I can stand on the shoreline for better photos, but it was certainly a satisfying challenge today from the car. 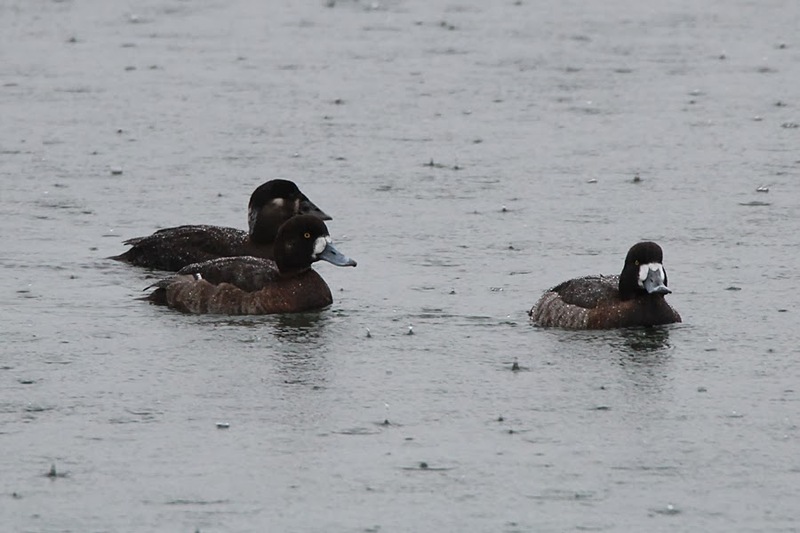 Greater Scaup were often close to shore, which allowed me to study their head shape. I always take the opportunity to study their head shape, which, compared to Lesser Scaup, is more rounded and has the high point towards the front of the head. 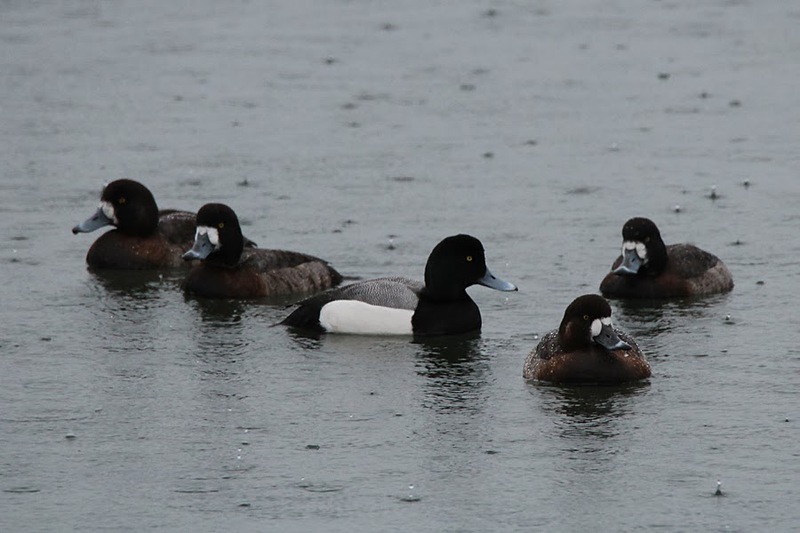 A perfect side profile of a male Greater Scaup surrounded by four females. 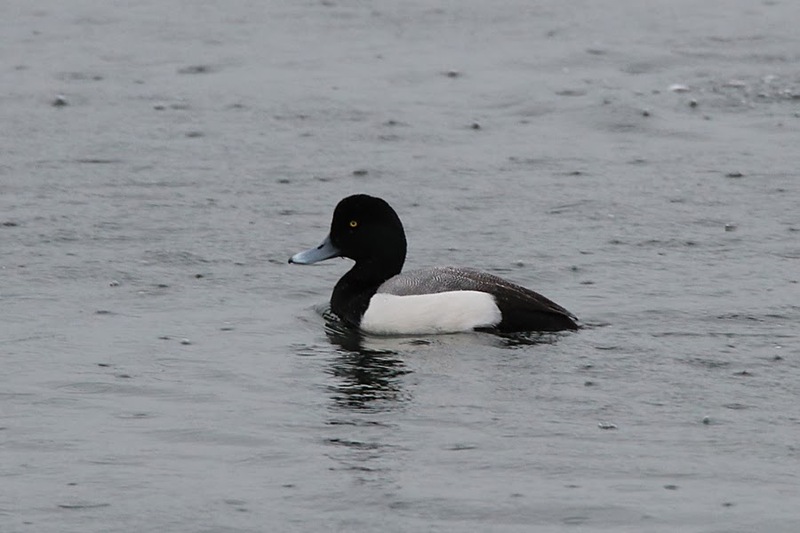 Another feature to note on the male is the clean white flanks, which is apparently more commonly shown by Greater Scaup. The females appear to show more extensive white on the face, which is commonly shown by Greaters. One last shot of a male Greater Scaup, which again emphasizes the head shape and clean white flanks. The grey appearance to the back is the result of fine barring; Lessers should have coarser barring. 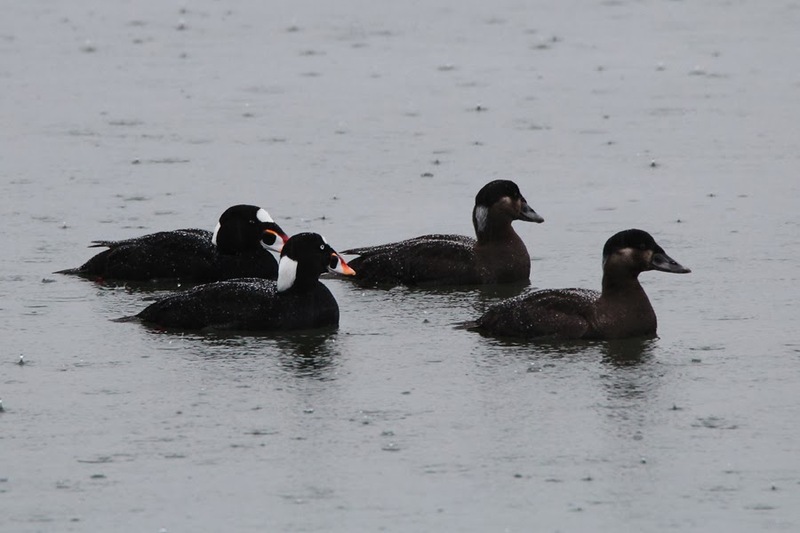 Surf Scoters are always a treat to see up close, so this group consisting of two pairs was a nice sight. 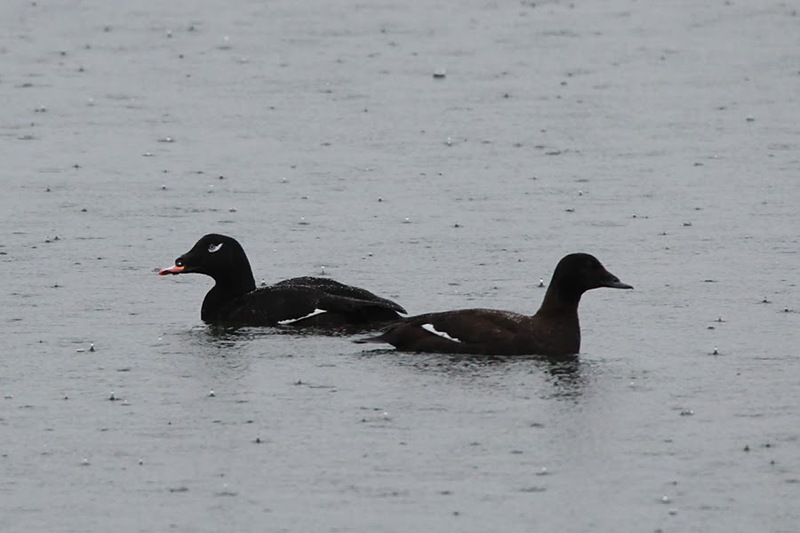 A pair of White-winged Scoters momentarily made it in relatively close to the shore. There is certainly a je ne sais quoi about scoters! 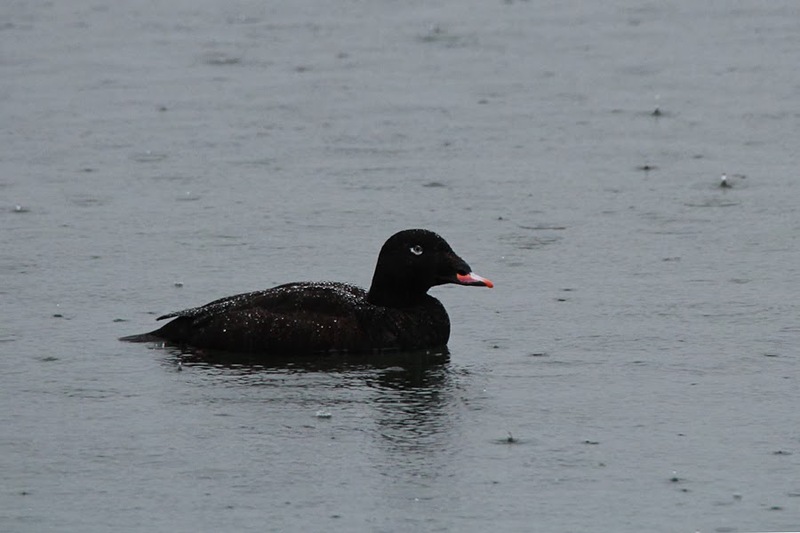 This appears to be a first-winter male White-winged Scoter to the best of my knowledge. I believe an adult would show a more prominent bump on the bill and a more extensive white mark under the eye. That's all I have to offer for now. I hope the next time it rains, this has inspired you to take a drive and never your leave your vehicle. Choose a good body of water you can drive right up to for best results!